question asked: Jun 05 '13, 4:30 a.m.
last updated: Mar 20 '14, 1:51 p.m.
ClearCase UCM and RTC: how do they get connected? How do I get RTC file types to be LF or CRLF instead of Platform when importing from ClearCase? Why does ClearCase Synchronizer silently miss some files? Why do I get "Reason Code: unauthorized" when importing from ClearCase? Simon Eickel (1.1k●6●51●56) | asked Jun 05 '13, 4:30 a.m.
closed Mar 20 '14, 6:10 a.m.
again it's me with a synchronizer problem. This message describes that the clearcase process could not be contacted ... but why? When I just rerun the synchronization process than everything works. Georg Kellner commented Jun 05 '13, 8:48 a.m. | edited Mar 20 '14, 1:50 p.m. It seems to be a ClearCase problem. On which host is the synchronizer running? Simon Eickel commented Jun 05 '13, 9:42 a.m. I think both assumptions are correct. The host is MU714723 and when I restart the sync everything is fine again. The question has been closed for the following reason: "problem is solved - I gave the solution myself" by eickel Mar 20 '14, 6:10 a.m.
Geoffrey Clemm (29.0k●2●30●35) | answered Jun 13 '13, 2:32 p.m. This means that periodically, the sync host (the machine where you are running the synchronization engine) is having trouble talking to the albd_server. 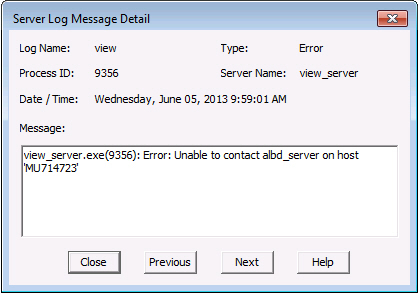 Are there other processes running on this machine that might make the albd_server unresponsive? One approach would be to try using a different machine as the sync host. Simon Eickel commented Jun 17 '13, 1:59 a.m.
nothing else is running on this PC but the synchronization engine and the Eclipse client to attach it. Geoffrey Clemm commented Jun 17 '13, 2:39 p.m. | edited Jun 17 '13, 2:41 p.m.
Then the next thing to investigate is whether there is a network load at that time (i.e. 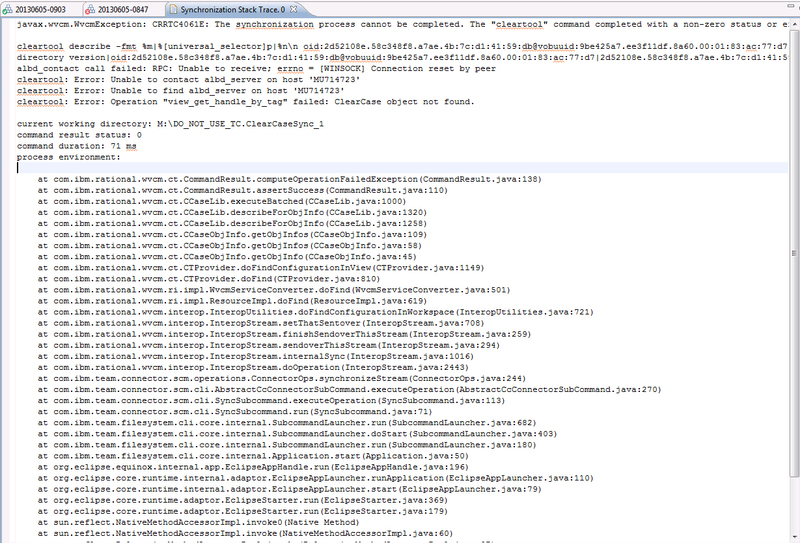 why the sync engine cannot talk to the registry server). If the sync engine cannot talk to ClearCase, there's no real work it can do. If you cannot get a sync host that has reliable access to ClearCase, you could add a few automated "retry" requests to your Synchronization schedule (e.g., one at midnight, one at 12:15am, and another at 12:30am). Simon Eickel commented Mar 20 '14, 6:10 a.m. | edited Mar 20 '14, 1:51 p.m.
After moving to a new host this error didn't reappear again.